Keep strangers out of your confidential files and find your phone if it’s lost or stolen. That moment when you reach into your pocket or bag only to grasp at air is stomach crushingly horrible. Staring incredulously at the phone shaped space where your mobile normally resides, you think about all the important, confidential things you have on there – photos, passwords, contact details, emails, maybe even bank details.That’s why it’s essential to secure your phone as soon as possible, and we’ll talk you through it right now. This free service on WindowsPhone.com can locate, ring, or even erase your phone remotely, in case it falls into the wrong hands. All you need is a computer connected to the internet. 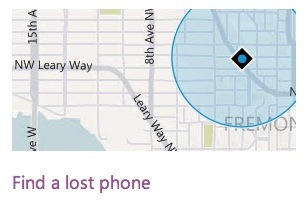 Before you can use Find My Phone, you’ll first have to create a Windows Phone account and then set up the service. On your computer, browse to windowsphone.com. In the top-right corner of the website you’ll see a picture of a phone. Hover over it with the mouse cursor, then click ‘Find My Phone’.This is the tool that allows you to map, lock or erase your phone remotely. When prompted, sign in with the same Microsoft account you used to sign in on your phone.You’ll be given simple instructions to set up Find My Phone. You should see a map, which shows the current location of your mobile. If the location isn’t highlighted, click the ‘Find My Phone’ button above the map, or the ‘Refresh’ button. You can print a copy if needed. On the ‘Find My Phone’ page, click ‘Ring’, then follow the instructions. Remotely calling your mobile in this way will make it ring loudly even if it is in vibrate mode. This is a great way of finding your phone if it’s hiding somewhere in your house. On the ‘Find My Phone’ page, click ‘Lock’, then follow the instructions. If you don’t already have a password set up on your phone, you’ll need to enter one now, which will be used to unlock the phone from now on. You can also type a message to display on your phone’s lock screen. Try entering an email address or phone number, so anyone who finds your phone can contact you. This is a last resort if you think you’ll never find your phone, or, like James Bond, you need to delete some sensitive information. On ‘Find Your Phone’, click ‘Erase’. Follow instructions to complete.